•	All manuals stated the publisher on the cover since there was no official military initiator. 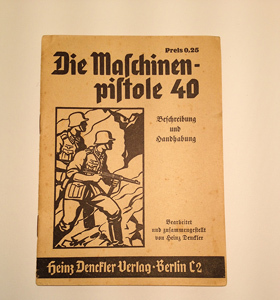 •	Most manuals have the price in Reichsmark on the cover. •	The civilian manuals do not use exclusively the “Faktur” font. A modern font is used in most publications. •	Some manuals contain an order list in the back. If the reader was enthusiastic about his manual he could easily order more by making use of this list. •	According to unconfirmed sources the commercial manuals were also purchased by the armed forced to distribute to the soldiers. In the light of the scarcity of military manuals this seems plausible. 1) Soladruck Steinkopf & Sohn, Berlin SO 16. Manuals from this printer are mostly encountered. 2) "Grafica" Druckanstalt in Pilzen 807. Rarely encountered. The printing quality of these booklets is more refined also the size of the booklet is slightly larger. 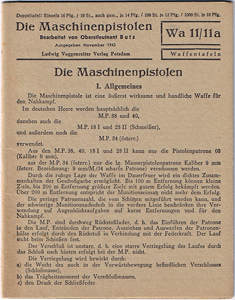 The Schmitt: Maschinenpistole 18I/28II/Erma/38/40/34 Leucht Pistole commercial manual was part of a set of 2 manuals covering most of the firearms used by the armed forces. The manual covered the MP18I/28II, the mp34ö, the Erma Emp, the MP38 and MP40. 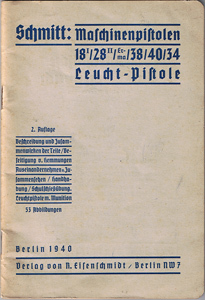 The text describing the MP38 and MP40 was again based on the “Merkblatt” series. Only the paragraph referring to the description of the weapon and the handling together with the pictures were included in this manual. 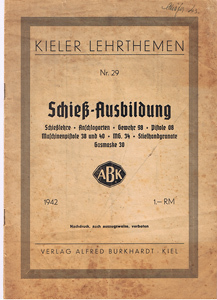 The "Kieler lehrthemen – schieβausbildung 29 – Verlag Alfred Burkhardt, Kiel (The Kieler educational themes – shooting training, part 29) was a whole range of study material offered to the military enthusiastic. It described the theory of ballistics, the ways to hold weapons when firing. The G98, the Luger Pistole 08, the MP38 and MP40, the MG34, the stickgrenade and the Gasmask 30. Again the text structure is almost similar to the “Merkblatt” series. No pictures are used in the manual. Apart from the printed version there are typed out versions reported. The Wa 11/11a weapons table was in fact not a real manual. It was a small fold out card that depicted the most commonly used sub-machineguns of the armed forces. It covered the MP38 and MP40, the MP18I/MP28 II and the MP34ö. The description of the weapons had to be aligned since the different sub-machineguns were described in a table next to each other.